Photo: You may have seen one of these bugs around your house. They can be a nuisance, not to mention they smell bad. These are brown marmorated stink bugs, an invasive species from China accidentally introduced to the United States in the late 1990s. You can tell them apart from native stink bugs by their black-and-white antennae and gray underside. Now that spring days have arrived in Indiana, residents who are sick of stink bugs and other critters can easily access a new weapon in the ongoing battle against non-native, invasive species. A mobile phone becomes the fastest, most effective way to detect and report invasive bugs by using a new app. The app has multiple uses, and can become a highly effective weapon in reporting the locations of invasive plants, plant diseases, mammals, fish and more. The new phone or tablet app allows users to take pictures of the potential invasive, add information and submit it to be verified. The system is called ReportIN, according to Carrie Tauscher, program coordinator of the Forestry Division, Indiana Department of Natural Resources. It’s currently being used by Nature Preserve and Entomology staff and trained Early Detector volunteers. Now, anyone in Indiana who wants to expand the effort to hunt for invasives can join the hunt. Just download the app. The ReportIN system also captures coordinates, and serves as a database for the reports it will generate. To join ReportIN efforts and help the Department of Natural Resources fill in the map that locates invasives, download the free Great Lakes Early Detection Network (GLEDN) app onto a smartphone or tablet. 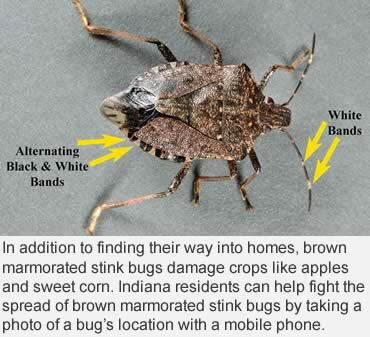 For more information on brown marmorated stink bugs, visit https://extension.entm.purdue.edu/publications/HN-90.pdf. ― From Community and Urban Forestry, Indiana Department of Natural Resources. — Photos courtesy John Obermeyer, Purdue University.